One of the virtues of travelling with a coaster club is safety in numbers. Adults visiting family parks without children in tow are often treated with suspicion or barred entirely, particularly in the United Kingdom where the memory of abuses committed by the late Jimmy Saville and his kind are fresh in mind. This problem tends to vanish when an organised group with name badges comes to visit, which just goes to show how nonsensical the whole approach is in the first place; after all, there is nothing stopping a would-be malefactor from infiltrating a coaster club. One of the first things I learned in my child protection training some years ago is that it is often the person you explicitly trust that presents the biggest potential risk. As of this writing there are no rules against unaccompanied adults at Milky Way Adventure Park, hence my visit there some years ago. 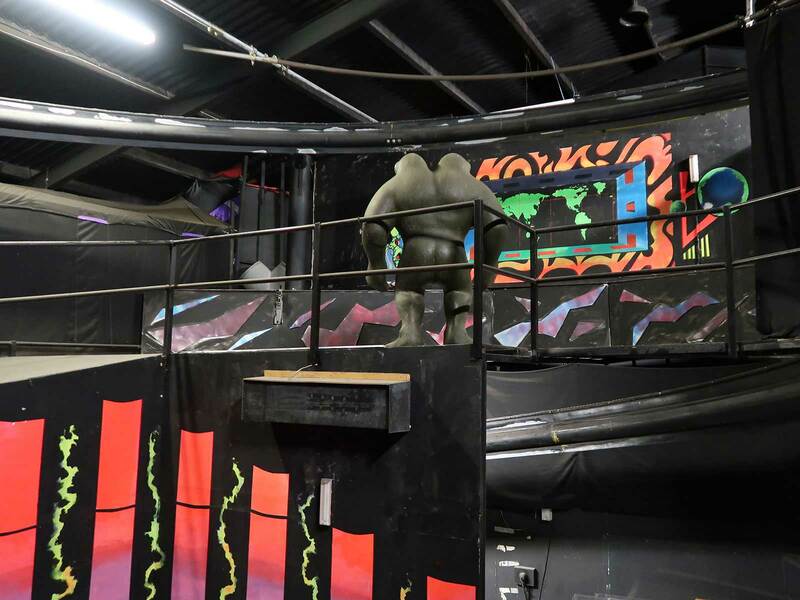 Nevertheless, a club visit provided a unique opportunity for a backstage tour of Clone Zone, the world's only powered Caripro Batflyer and the only example of the genre to operate indoors. We were able to walk through the loading station and into the main show room, where we could see much of the layout and theming with the work lights switched on. The imagery was very much a product of the late nineties, but well suited to a family park and in any case more than adequate considering passengers generally only see it for a second or two in near darkness. During our tour we learned about the provenance of the ride. In the mid-nineties the owners of the park decided that they wanted to install an indoor roller coaster, and having identified the available space went to various manufacturers seeking proposals, eventually settling on the design that exists today. I asked what the park does for spare parts given that Caripro disappeared during the mid-noughties, and was surprised to learn that everything is manufactured in house; the hardware was supplied with detailed specifications and schematics, meaning that it is expected to remain in service indefinitely. This was good to hear given that just three of the seven original installations are in operation as of 2017, suggesting that their days are numbered. With the tour concluded it was time to enjoy the experience as a regular guest would, beginning with a lengthy guided walkthrough through a crashed alien spaceship that "has been here for many years". There were a few points during this tour where guests spread out, and readers are advised to use this time to move towards the front of the group, as the coaster has quite low capacity (one adult per car) that can result in a potentially significant wait. It's worth recording also that the restraint design is not conducive to larger riders; at least one of our group had to sit out the experience because the restraint was unable to close around him. Once actually on board the ride is short and charmingly hokey, comprising a brief climb, a descending helix, and a return to the station. Despite its brevity however I really enjoyed it, and I was one of a small number of our group who decided it was worth going back for a second round. The weather outside was dismal, but there were two more coasters to be endured. Our first was Cosmic Typhoon, which we were told came from Daniel Pinfari despite the cars carrying prominent Interpark branding. The ride looks a little odd at present as the park is halfway through repainting the track from its original blue to a bright orange. We learned that this work is being done without any disassembly in order to save money, and that were the ride to be taken apart in the future it would be turned around as the current positioning is the opposite of the prevailing winds in the area. 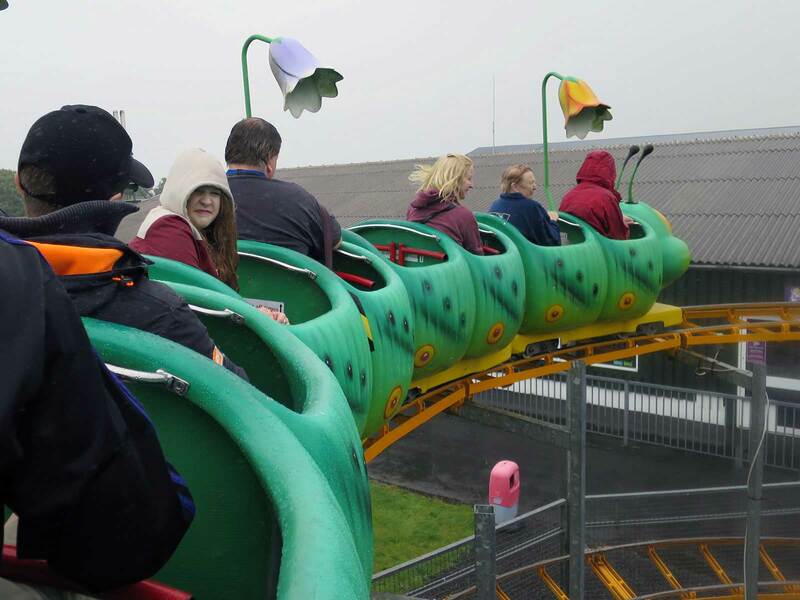 We completed three enjoyable laps that were punctuated by some pleasant moments of airtime, and we were also given the opportunity to take some photographs from inside the ride superstructure, though poor weather ensured that these didn't come out well. With that out of the way the hardiest among us boarded the Cosmic Caterpillar (#2349), where the wet seats immediately took their toll on our clothing. Even as a willing participant I found myself laughing at the thought of a train full of credit whores getting thoroughly soaked for a pathetic checkbox on a list that nobody would ever care about beyond themselves. The more sensible in our group (if that isn't an oxymoron) were more than content to watch from ground level. Our guide could easily have stopped the train after one lap, but chose for comedy effect to let it continue for a second even as the rain began to fall more heavily. One of the more unusual exhibits in the park is an impressive collection of Star Wars memorabilia spanning several rooms that covers everything from soft toys in their original boxes to full size replicas of scenes from the various movies. The harmonised bleeps from a classic pinball machine didn't quite do justice to John Williams' famous soundtrack, but that constitutes a nitpick for an area that a serious fan could easily spend hours in. The park website notes that this installation was donated by one individual, and given that licensed products rarely come cheap it seems likely that their budget was a multiple of what I've spent on my coaster hobby over the years. The group elected to spend much of the remaining time enjoying tea and biscuits in the park restaurant, but they did at least stage an informal takeover of the Droid Destroyers, a 2500 square foot dodgem track augmented with flashing lights and music. Today the ride was being operated in an interesting fashion that I'd not seen before; for the first minute or so the cars were set at low power, before being increased to full speed once people were fully comfortable with the controls. The experience wasn't quite to the level of those yesterday, but we enjoyed our cycle nevertheless. We were met outside the Big Sheep by the owner, who was resplendent in a striking polo shirt proclaiming him Leader of the Flock. He welcomed us briefly, before launching into the history of his park and what he has had to deal with over the last few years in order to install and commission the Zierer roller coaster acquired second hand from the now-defunct New Metroland. He was obviously delighted to have an enthusiastic audience to talk to, perhaps explaining how his impromptu talk managed to last an incredible thirty minutes without any obvious repetition. Things wrapped up just in time for us to catch the Dog Trials, a demonstration of a thirteen year old dog herding five sheep based on spoken commands. We were told that the show would be abbreviated today because the star wasn't "having a good day", though it actually ended up being cut for a different reason after one of the sheep stumbled on wet ground, hurting a leg. The animals were right next to the pen at this point, and thus they were herded into the pen and things were called to a halt. Our second stop was at the Eweston Train Ride, a railway that took us around the lake at the centre of the park. 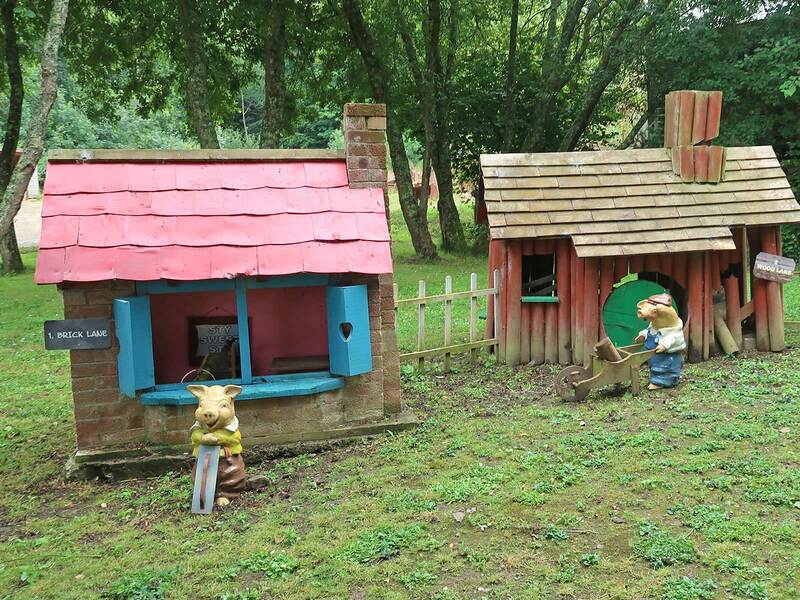 Various items of interest could be seen along the way, including faces carved into trees, the three little pigs in front of their respective houses (complete with sign saying Sty Sweet Sty), Humpty-Dumpty, and a model of Rams-Gate station with a besuited animal at the point controls. The ride had limited capacity thanks to a maximum of two adults in each car, but we worked around that by dividing into two groups. With that done we made our way across to the coaster. The heritage of Rampage was obvious almost immediately as we noted the apparently over-engineered support structure for the first lift hill that dates from its time inside a building. The same section of track also had safety cages underneath the tyre drive motors, something rarely seen on other Tivoli coasters but an essential safety requirement when people can walk below. The rest of the course looked fairly normal aside from the presence of a large grassy mound in the middle which apparently reduces the operational noise footprint. Later on I learned that the total cost of installation was in the region of three quarters of a million pounds, far more than had been anticipated, though still a bargain price for a high quality steel coaster. Though I'd ridden the coaster in its previous home it's fair to say that I remembered almost nothing about it, my trip report from the time being somewhat sparse. As such I had little idea of what to expect as we climbed the brief lift hill and rounded a long and mostly flat ninety degree turn to the left. The first drop led into tight descending helix that was both smooth and forceful, followed in short order by a very wide left turn, a second lift, and some airtime hills. The tracking is perfectly smooth, and the custom layout makes the ride infinitely more interesting than the marginally shorter standard model found at parks around the world. Today all riders were being given two laps for each dispatch, and by pure luck we managed to score both back and front. Our group also decided to try the Twister Chair O Plane, an SBF Rides Family Swing decorated with a wide variety of symbols covering everything from droplets to Tetris pieces. I'm glad that we made the effort, as the operator was fantastic, announcing to the kids on board that they should flap their arms if they wanted to go higher. Many did, providing an amusing spectacle for the rest of us. Meanwhile Naomi spent virtually the entire cycle talking on her phone, a conversation likely not made easier by the incipient breeze. 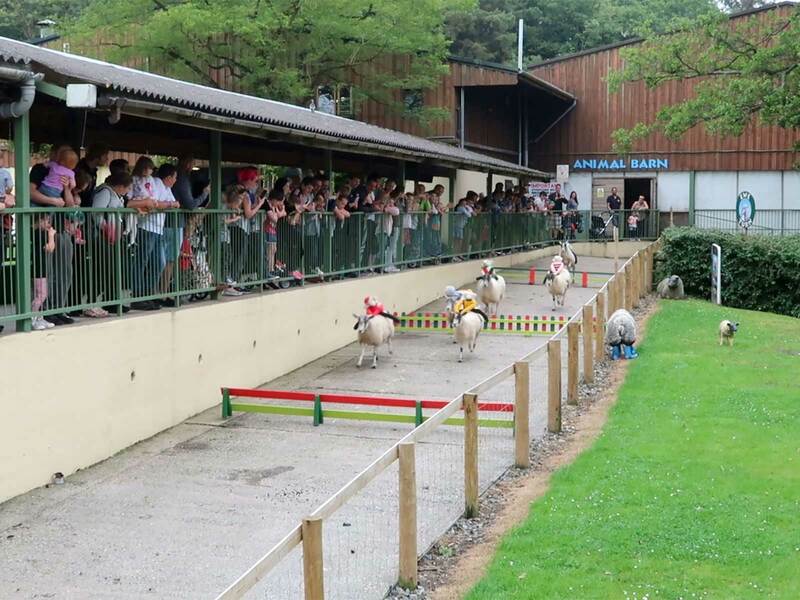 The highlight of the day, weekend, and possibly even the year so far was the fantastically silly Sheep Racing, which was every bit as nonsensical as it sounds. There were six sheep in total, "ridden" by soft toys in brightly coloured jackets, and visitors were invited to place bets on the overall winner. Details of the competitors and numerous silly facts were announced before the final race, with the park's youngest member of staff, a five year old child, announcing the various names in a clear voice. Sheargar, Little Pullover, Golden Fleece, Alderknitti, and Woolly Jumper put on a valiant performance, though the final victory today went to Red Ram who seemed far more interested in the bucket of food at the finish point than the rapturous cheering from the masses.